In order to find out the tetragonal or square numbers that are 1, 4, 9, 16, and 25, one had to find the summation of the terms of a progression in which the difference of terms was 2, that is, a progression of odd numbers like 1, 3, 5, 7, 9. Pythagoras believed that the soul was tetragonal and we will come back to this fact to emphasize that the ideas attributed to Pythagoras are without any doubt of Egyptian origin. let us come back to the tetragonal or square numbers. 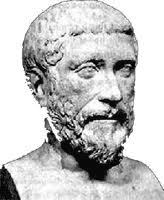 According to Pythagoras they characterize the shape of the soul. They can all be found be means of a series of successive rectangles called "gnomons", from a square unit. One then obtains, as described above, the series of odd arithmetic numbers: 1, 3, 5, 7, etc. All this explains the importance of the tetrad and the gnomon in Pythagoras' philosophy. Pythagoras and his disciples have been so much influenced by Egypt that, in spite of the fact that they spoke a different language and had a different writing, they did use the Egyptian hieroglyphic signs in their pre-algebraic mathematical notations. For instance, they used the hieroglyphic sign for water to symbolize the progression of numbers. The series of odd numbers was represented by a right-angle shaped gnomon (7). The series of even numbers was represented by the sign (=) of the scale. The circle, which was the sign of the Ra, the Egyptian sun God represented eternal motion (O). We cannot show in a more convincing way that the whole of Pythagoras' philosophical doctrine as well as his theory of numbers were extremely indebted to Egyptian thought.